Thanks for stopping in to check out the revamped Halcyon Acres® website. As you can see, while the horses are still part of this business (we’ll jump in from time to time with stories, news and updates), we’re putting a much stronger focus on produce. Feel free to poke around (the site is still under construction, so you’ll probably notice changes each day) and let us know if there’s anything you’d like to see covered – or illustrated. Herbs can create beautiful additions to your landscape (most have delicate and attractive flowers) that also provide tasty options for enhancing a meal. Most are perennial and require little maintenance. All tend to transplant well, so you can start them in one area and then position them where you want around your yard or house after they’ve matured to a hearty state. If you’re starting seeds outside (now is not the time for this – wait until spring), keep them weeded early as most young shoots don’t compete well with other plants. Good selections for zones 5-6 include sage, oregano, lavender (this one’s iffy outdoors if the winter gets cold but can be transferred to a container and brought inside), thyme and dill (not a perennial but it’s good at reseeding itself). If you’re new to herb starts, it can be hard to figure out what these plants look like coming out of the ground. There aren’t too many sites that provide visual depicting young plants. So, we’ll be adding pictures to help you identify your seedlings periodically. Check back as we’re still working on this section. If there’s something in particular you seek, let us know and we’ll try to capture and post the image. It’s fall in Upstate New York. While the leaves are changing and the tomatoes and summer squashes are suffering a bit from the rain that finally came (almost daily after a summer drought), most of the plants are doing great. Watermelon, cantaloupe, acorn squash, spaghetti squash, eggplant and sweet potatoes are now ready for harvest. We’re finally getting some head lettuce (silvia, freckles and standard romaine) after an early spring and summer that was too hot for these items. The loose leaf continues to be a favorite as we’ve been planting almost weekly and harvesting baby lettuce for clients. It’s been a great year for herbs. 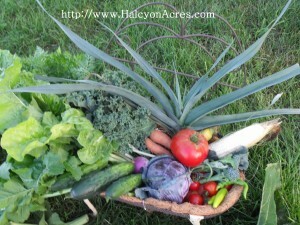 Fresh sage, oregano, parsley, basil, cilantro, thyme, rosemary and lavender are still plentiful. Speaking of herbs, check out this handy slide show 10 Healthy Herbs and How to Use Them, for some fun tips and surprising features of these healing food items. This past week’s focus has turned to rolling up feeder hoses, taking down pea fences and flag markers, harvesting cut flowers, digging up some of the perennial flower and herb plants for clients to enjoy in their gardens next year and beginning to prep the soil for spring planting. If you’re in the Greater Rochester area (Eastern suburbs, Canandaigua, Farmington or Victor) and would like to enjoy fall produce (we still have large quantities of hard to find and/or expensive food items such as Swiss chard, kale, turnips, herbs and a lot of other items requested as special plants by clients) we can deliver to your home or office, or you’re welcome to schedule a trip to the farm with family (appointment required) to select your package mix and witness the harvest. Call (585) 554-4612 for more information. If fresh herbs are what you seek, these ship well. We can assemble a very generous package custom selected for your tastes. US orders only. Great post by the way. I’ll be tuning in frequently for your tips. I read something this week (probably from a felolw UBC participant wish I could recall the source to quote and attribute as it was marvelously stated) that we should be thinking of food relative to how it helps our body function by being aware of how our intake makes us feel, perform, summon more energy, etc. The way this was expressed (I’m not doing it justice) really got me thinking. Of course, we’ve all heard the fuel you body and mind, you are what you eat, etc. and the scientific justifications for healthy eating, but this writer came at it from a different direction. In part this included keeping a journal to record how certain foods affected mood and performance during the day, but mostly it was suggesting a very interesting mind shift in a way I hadn’t heard stated before. Yes, I’ve read a lot that talks about the right attitude with food (and dismissed most of this I really like to eat) but this made sense to me in a way I could apply it and still feel good about smart choices. I’m sure he’s in CA for the reasons you state. I just found it funny he wasn’t in China. Thanks for the feedback, Laurie. I’m still getting my arms around this new site. Yes, certainly, I’ll increase the point size in future posts (in fact, I’ll probably play with this one to see if I can change the default. Again, I appreciate your stopping in and offering some great input. like I can possess with regard to healthy and balanced foods. you can give more than one dinner for each that could be AMAZING. Furthermore, any tips or perhaps anything would certainly awsome as well. I am a fan of the turnip, hoewver no many in my family feel the same way. If I use it in soups they are ok with them (I think they work their way around them)but if I make mashed turnips for dinner it will be pretty much my dish.I’m still not a big fan of kale but the more I learn about it, the more I want to add it to the menu.As for Debbie living i the colder part of the country, I think we need to do a little canning to cover those winter months when nothing is growing outside..Some herbs can be grown in the house all year. I have a very nice rosemary tree in the kitchen window. I would love to find copies of The Chinese Almanac to learn more.Thanks for sharingChef William recently posted..